Only shows product reviews in current shop language; new ones are added depending upon the customer's current language. 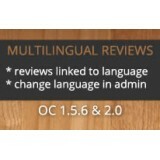 Also adds admin module for switching assigned review language. 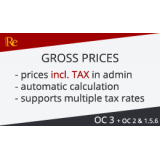 Enter gross prices (prices including taxes/VAT) in the administration. The extension will automatically display correct prices on product pages and checkout. Works with multiple geozones with different tax/VAT rates.